Oklahoma SB 1456: Why the Tea Party is fighting for solar power. Utility companies are waging war on the solar industry. But the clean energy movement has found an unexpected ally in their fight. 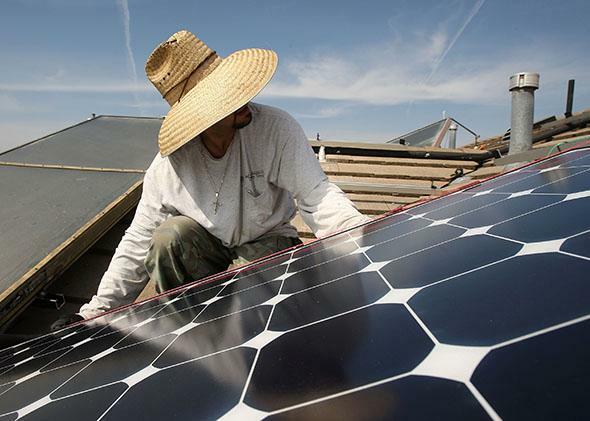 An Solar Forward employee installs solar electric panels on a rooftop in California. Last week, with little fanfare and even less debate, Oklahoma lawmakers quietly voted to reverse a nearly four-decade-old law that had barred utility companies from charging customers who install solar panels on their homes more than those who don’t. The bill, which passed almost unanimously, would have effectively cleared the way for utilities in the Sooner State to force homeowners who install solar panels to pay for both the electricity they buy from the grid and for a portion of the electricity they sell back to it. The vote marked a rare victory for power companies in their quest to stymie the growth of the rooftop solar industry. It also represented a sharp departure from the wave of well-publicized, big-dollar federal and state efforts currently aimed at making solar energy cost competitive with more traditional energy sources like coal and natural gas. Then, on Tuesday, to the surprise of pretty much everyone involved, Oklahoma’s Republican governor, Mary Fallin, issued an executive order largely undercutting the provision, dealing an unexpected defeat to major utilities and their deep-pocketed backers—a group that includes the Koch brothers and the American Legislative Exchange Council, a powerful national membership group for conservative state lawmakers. Perhaps the only thing more surprising was who had helped defeat Oklahoma’s power companies. Tucked among the usual green suspects were the type of advocates that typically don’t associate with the clean energy movement but have nonetheless proved crucial to securing a political victories in a string of dark-red states: Tea Party conservatives. As unusual as that strategy may seem, it’s been a surprisingly effective one. The group boasts an impressive track record of defeating the utility companies’ effort to make solar panels less appealing for homeowners through a variety of proposals, from imposing user fees to reducing the price at which consumers can sell their surplus electricity back to the grid. TUSK and its conservative allies have repeatedly found success placing those utility-backed proposals within a free-market frame that speaks directly to conservatives. User fees are just another name for a new tax, argues Goldwater and his outfit; a change to the sale price is just another attempt by the government to limit individual choice, they say. The industry argues that anyone who is selling their surplus electricity back to the grid is doing so without having to pay for the wear and tear on the grid itself. That infrastructure upkeep, the utilities say, will be passed on to consumers via their monthly electricity bills, meaning that nonsolar users will have to unfairly foot the bill for their early-adopting neighbors. Such arguments, solar proponents counter, don’t fully take into consideration the amount that the utilities themselves benefit from wider solar use, which provides the grid with a clean, reliable source of electricity when it needs it most, during hot, sunny days when residents crank up their air conditioners. TUSK’s record, at least as tallied by the group, is now 11–0 following Fallin’s executive order, with victories spread out over a large swath of states, most of which were won by Mitt Romney in the 2012 election. You could argue that some of those wins were by TKO and not a knockout—the Oklahoma law still technically leaves the door open for user fees, for example; utilities were able to win a small $5 user fee in Arizona, but not the $50 to $100 one they were originally asking for—but it’s difficult to argue that the group hasn’t gotten the best of the powerful utility industry despite being heavily outspent at almost ever turn, in some cases by a margin of more than 10-to-1. Utility companies, which burn fossil fuels to produce most of their electricity, aren’t necessarily afraid of solar, just those rooftop panels that are increasingly being installed on homes and businesses around the country. (A recent estimate from the solar industry indicated that someone is installing a new solar panel system somewhere in the United States every four minutes, on average.) While solar still accounts for only slightly more than one-tenth of 1 percent of America’s electricity, that does little to soothe the fears of utilities, who view rooftop solar panels as an existential threat. The big utility worry is that as more and more solar power-producing homes pay less and less each month, the cost for traditional consumers will go up, making a jump to solar that much more appealing. A report by the Edison Electric Institute, a leading utility group, made it clear that making consumers who sell their surplus back to grid pay more for the privilege was a “near-term, must-consider action” for the entire industry. And in the roughly 18 months since that report was published, utilities have done just that. Their chief problem, however, has been that they and their conservative backers have run into unexpected friendly fire. And if they can’t sell their anti-solar pitch in red states, they’re not likely to have better luck in the blue ones, either.